Head north from Route 14 back into Tapu Village. Heal up, then head back towards the Aether House. 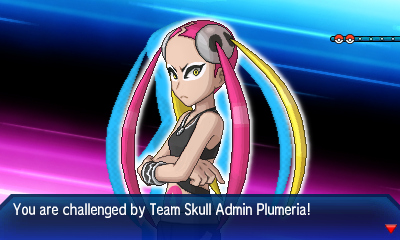 Here, Team Skull Admin Plumeria will challenge you to a battle. She has a Lv. 37 Golbat and a Lv. 38 Salazzle in her party. You'll get a Rare Candy after the battle. Head left, taking out the trainer along the way. 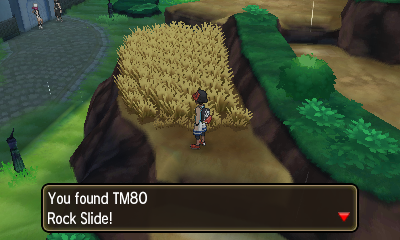 There's also a Hyper Potion in the tall grass. 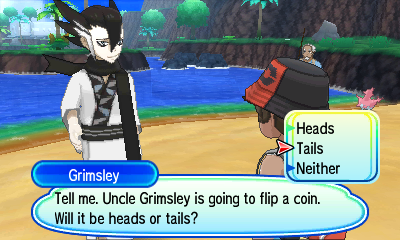 Speak to the man on the beach; he'll introduce himself as Grimsley. He'll register Sharpedo to your ride pager. Hop on Sharpedo and head onto Route 15. There's a trainer just north here, and another on the center island. 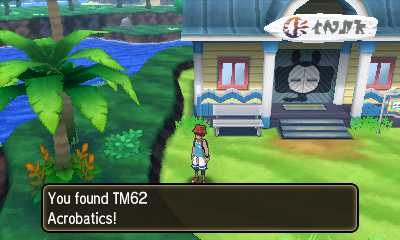 You can also find TM62 - Acrobatics on this island. 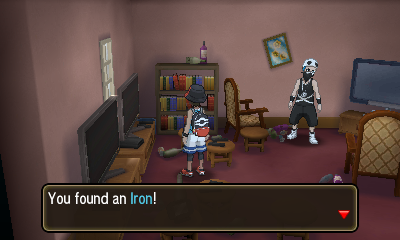 There are a few more trainers in the area alongside a Dive Ball that you can pick up if you wish. Otherwise, just head onto Route 16 to the north. Heal up at the Pokémon Center here if you'd like. There's a trainer and a PP Up to the east here. There's also a berry tree to the left. Head north into Ula'ula Meadow when you're satisfied. 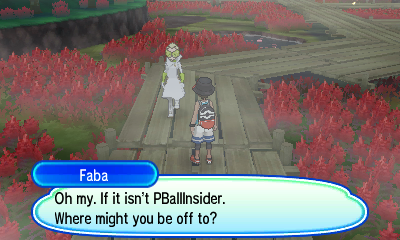 Once you get to the boardwalk, a brief cutscene with Faba will ensue. In the first little area you'll find a trainer and a Repeat Ball. There's another trainer you can battle to the right. 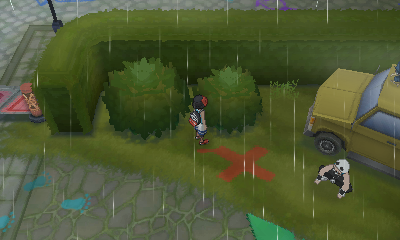 If you explore the left side of the meadow for items, you'll find a X Sp. 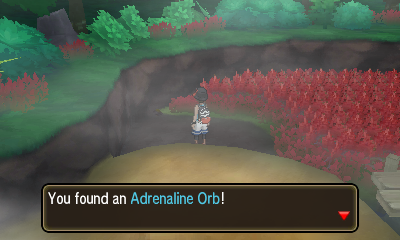 Def, an Adrenaline Orb, and another trainer. Exit the meadow to the north. On Route 17, there's a fork in the road. If you head right, you can explore the cliffs for a number of goodies. 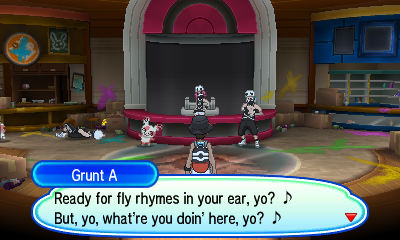 You'll find a Full Heal, a Lemonade, a Nest Ball, TM80 - Rock Slide, and a trainer. Otherwise, fight the two grunts and continue north. Approach the two grunts blocking the door and engage in a double battle. You'll then be let in by a mysterious man. Once in town, crawl through the hole to the left to get past the barricade. You'll then need to defeat two grunts. 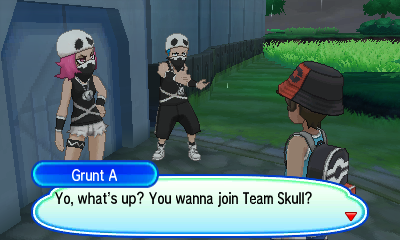 Heal up now if you'd like (Team Skull will charge you). You can take on some battles and pick up a Full Restore if you'd like, otherwise keep heading north. Defeat the last grunt and enter the Shady House. Immeadiately exit the house via the side entrance to find a Ice Stone. Enter the back-left door on the first floor to find a note reading "Poison Jab". Enter the other door in this hall for a Max Revive. 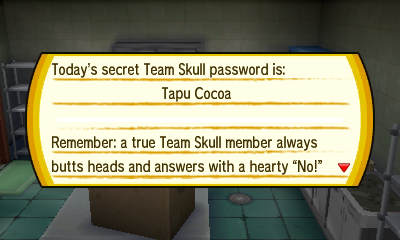 Enter the door by the staircase and continue through doors until you reach a note that reads "Tapu Cocoa". There's also a Heal Powder in this room. You'll need to defeat a grunt along the way. Head up the stairs and into the bottom-left door. Defeat the grunt and pick up the and the final password, "Bounsweet". Now, approach the grunt blocking the door to the south. Give him all the passwords you found and then answer "No!". Grab the Escape Rope on the balcony and enter through the window. 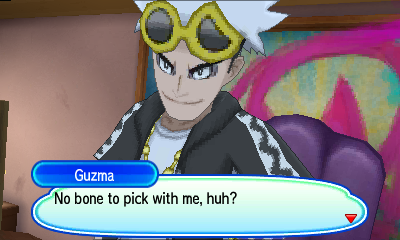 Head through the next door to find Guzma. You'll need to defeat him in battle, he specailizes in Bug-type Pokémon. He has a Lv. 41 Golisopod, a Lv. 41 Pinsir and a Lv. 41 Masquerain. 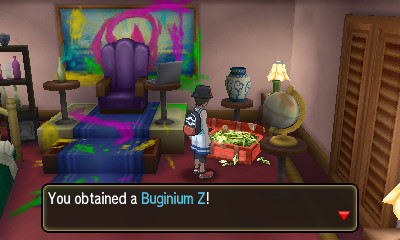 After winning, pick up Buginium Z from the pile of riches. Exit the house and Nanu will heal your team during a cutscene. Fly back to Tapu Village and head back to the Aether House. After a few cutscenes, Gladion will challenge you to a battle. Defeat his Lv. 42 Golbat, Lv. 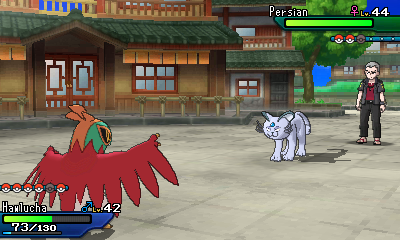 42 Zoroark, and Lv. 43 Type: Null. Afteward tell him no so that you can heal up. Fly to Malie City and head to the ferry. 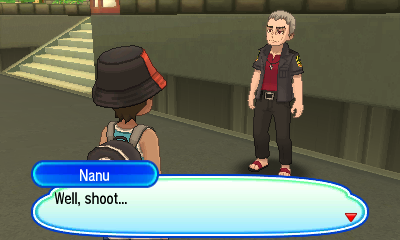 Here, Nanu will reveal himself as Island Kahuna and challenge you to a battle. Accept and defeat his Lv. 43 Sableye, Lv. 43 Persian, and Lv. 43 Krokorok. As a reward, you'll get Darkinium Z. You'll find yourself at Aether Paradise when you regain control.